Blue Mars Blog: Blue Mars Fashion Roundup! Looking for some new styles for your avatar? Here is a cheat sheet to all the best shopping in Blue Mars! Mako Magellan makes Caledonia his home, with a shoe store exclusively devoted to his line of women’s heels and boots, and a clothing store showcasing his elegant designs for men. Whether it’s a morning suit, a tux with tails, or a hairstyle from 1830 you’re after, just stepping into this shop will make you believe chivalry isn’t dead. The future and the past collide in Posture is Everything, which offers everything from Victorian inspired gowns to futuristic latex mini skirts. Irkmade displays a line of hair for men, and a collection of leather boots, and some funky tribal dresses for the ladies. Chimeric Fashions, with its line of Victorian dresses, will take you back to a simpler time. Once you have your corset laced, and your lace handkerchief fluffed, step into Candy Bytes to find Victorian hairstyles and high button boots to complete your look. Caledonia also features shops Adam and Eve, and Barsoom Beasties, which will be adding merchandise soon. Fashion Esplanade is a newly opened fashion boardwalk designed by the lovely Estelle Parnall. There are both men’s and women’s fashions available now, but keep checking back, as there will be new merchandise added regularly. Tharsis Estates features two shops. Tirion Designs, offers a range of fun and funky clothes for women, and slacks, button down shirts, and tees for men. Also featuring a variety of shoes and hair styles for both sexes. Grounded showcases the versatility of the exuberant Marlii Rev, displaying everything from jeans and tees, to vintage 50’s and 60’s inspired pieces. 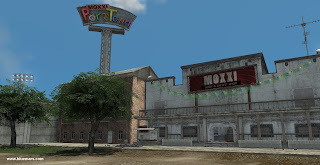 There are 4 multi-designer shelf shops, with clothing for men and women located on the ground floor of Beach City near the spawn point. Check out our newest Beach City shops, located on the second floor of Beach City, directly across from the spawn point. Estelle Parnall’s sophisticated ladieswear, Arzach Mills’s imaginative clothing and avatar skins, featuring everything from Minotaurs to Dragons, and El Electron’s casual menswear, offering jeans, tshirts and sneakers. Hair Today, Gone Tomorrow- visit the first Blue Mars hair shop, featuring fun styles for men and women! Looking to play dress up? The Women’s Store in Cloud City offers creative options like a sailor outfit, a French maid ensemble, and a Mrs. Claus suit that will keep anyone off the Naughty list! The Manly Man store offers great options for those Blue Martians with a Y chromosome. Cloud City offers you another place to see Marlii Rev’s designs, she recently opened a second Grounded store. DRX Designs is the place to be if you’re looking for a cowboy hat! Also featuring men’s and women’s clothing, and bunny slippers, for your inner Thereian. In the market for some sandals? Zuma designs offers a great line of flip flops. Check in at Orielle and Antaios' Pink Fizzy Soda Designs for flirty dresses for ladies, and bunny slippers, preppy sweaters and a fun line of custom bowling shirts for men and women. The Misty Hollow General Store features jewellery, sunglasses and quirky graphic tees from a variety of designers. It’s time to get a little futuristic! Bring out your inner Judy Jetson in sky high moons boots, latex tube tops, and shiny body suits. 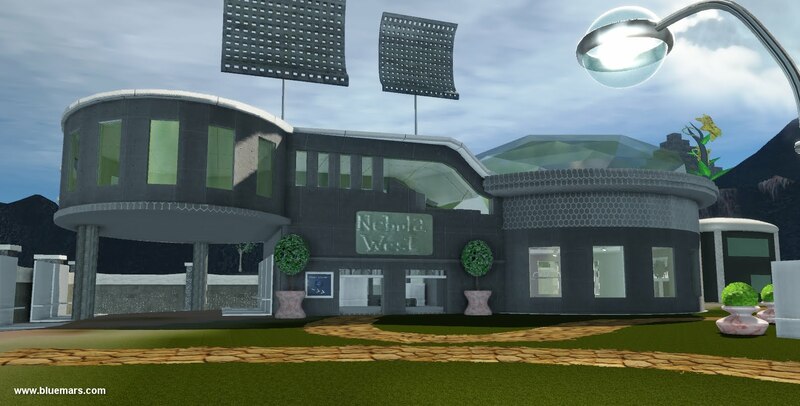 The girls don’t get to have all the fun, shops Nebula West and Rom-U-Licious also have graphic tees, jeans, leather jackets, and some seriously spiky moon boots for men. Grid Rock City also features an outdoor marketplace, displaying skins and clothing from various designers. Blue Mars’ resident DJ Sage Sapphire designed the City of Gaia, the Sage designs shop, and all the clothing inside! Pop in to see her Goth inspired looks! Visit Moxxi in Port Town for beautifully designed skins for men and women, and funky new fashions for your avatar. Located in the dome directly across from the spawn point, Shade City clothing offers a large variety of tops, jeans and dresses for women, and some cool Shade t-shirts for men. Gear up for Halloween at Venezia’s new Costume Trends shop! Show off your inner witch, take a Frankenstein mask for a spin, or command authority in a security guard ensemble. Swing by Singtel City to view a small sampling of clothing items, just a teaser of the bigger things to come! Remember, new merchandise and new stores are appearing in Blue Mars daily, so keep exploring to stay ahead of the trends! For more Blue Mars Fashion info, check out http://bluemartianmode.com/, Marlii Rev's Blue Mars Fashion Blog!